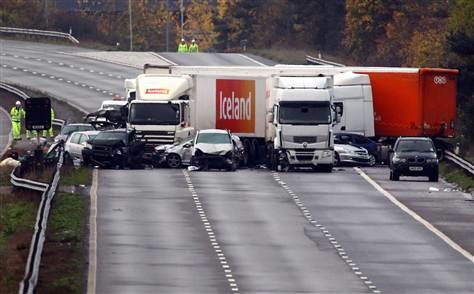 A huge crash involving 34 vehicles on a highway in southwestern England killed at least seven people and injured 51, British police said Saturday. The crash on Friday night involved explosions, and cars and tractor trailers burning "literally to the ground," Assistant Chief Constable Anthony Bangham told reporters. Police expect the death toll to rise and they fear they may find more bodies in the wreckage, Bangham said. Video footage shown on British news channels showed large ***** of fire consuming trucks, and billowing smoke at the scene. It was not immediately clear what caused the collision on the M5 highway, but police said foggy conditions and wet road surfaces were partly to blame. Road accidents of this scale are rare in Britain, and rescuers have described the pile-up as one of the worst in living memory. A handout picture taken on Friday shows a fire caused a massive crash on the M5 motorway near Taunton, southwest England. A The affected section of the busy highway has been closed in both directions as police remove all vehicles for forensic examination. The highway will not be reopened until Sunday at the earliest, police said. Does this BOV give one big swoosh or several?